OTTAWA - Canada's trade deficit grew to $3.34 billion in May compared with $3.0 billion in April, increasing the chances the Bank of Canada will cut its key interest rate next week, economists said Tuesday. BMO senior economist Benjamin Reitzes said Canada's trade balance is on pace for a record deficit in the second quarter. "This report caps a run of soft data over recent months and suggests that trade will not be nearly as positive as anticipated at the start of the year," Reitzes said. "Unless we get another massively positive jobs report on Friday, there's a good chance Governor (Stephen) Poloz will cut rates at next week's policy meeting." 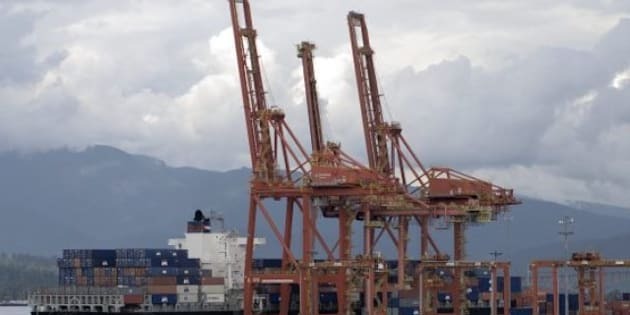 Statistics Canada said earlier Tuesday that exports declined 0.6 per cent in May to $42 billion, while imports edged up 0.2 per cent to $45.3 billion. Economists had expected a deficit of $2.5 billion, according to Thomson Reuters. Statistics Canada said export volumes decreased 2.5 per cent while prices increased 1.9 per cent. Meanwhile, import volumes were up 0.3 per cent and prices edged down 0.1 per cent. "All told, the weakness in volumes on the export front will have markets worried about May GDP, although we still expect better news from other categories like retailing," CIBC chief economist Avery Shenfeld said. "That's one more chip on the side of our forecast for a rate cut by the Bank of Canada next week, with Friday's employment data still one more hurdle to cross." The Bank of Canada is set to make its next rate announcement and release its monetary policy report on July 15. The central bank is widely expected to cut its economic outlook, but what happens with its key interest rate is less certain. A key economic data point will be the Statistics Canada labour force survey for June on Friday, providing a look at how the country's job market is faring. Canada's exports to the United States in May fell 0.3 per cent to $32.0 billion, while imports from Canada's largest trading partner increased 0.5 per cent to $30.0 billion. Exports to countries other than the United States fell 1.6 per cent to $10.0 billion in May as shipments to the United Kingdom dropped $345 million and exports to China decreased by $307 million. Imports from countries other than the United States were down 0.2 per cent to $15.5 billion. The drop in exports came as shipments of in metal and non-metallic mineral products as well as metal ores and non-metallic minerals were largely offset by gains in aircraft and other transportation equipment and parts as well as motor vehicles and parts. Exports of metal and non-metallic mineral products were down 5.8 per cent to $4.6 billion, while metal ores and non-metallic minerals fell 9.2 per cent to $1.4 billion. Exports of aircraft and other transportation equipment and parts rose 10.3 per cent to $2.1 billion, while motor vehicles and parts gained 2.7 per cent to $6.9 billion. On the other side of the equation, imports of consumer goods were up 2.3 per cent to $9.7 billion, while metal and non-metallic mineral products rose 5.0 per cent to $3.8 billion. The energy sector saw exports increase 1.3 per cent to $7.7 billion in May as prices rose 8.4 per cent and volumes dropped 6.5 per cent. Imports of energy products were up 2.9 per cent to $3.0 billion, on higher prices.